Upon entering the gallery space of the newly refurbished Hayward Gallery it becomes immediately evident why Andreas Gursky was chosen as the first artist to reopen the iconic venue: his large scale photography, all shiny surface and saturated colours has a monumental magnificence that beautifully compliments the equally magnificent concrete mass that is the Hayward. This is the first major UK retrospective of the German photographer who has been exhibited at the National Museum of Art in Tokyo and the MoMA in New York. Gursky is a chronicler of global economy and modern day life, his oversized images depicting epic spaces that define the present era. His early work from the 1980s, on display in the first room, explores the relationship between human beings and their environment, and the way landscapes have been altered by human invasion. Gursky’s unique trademark is the super wide angle: images taken from extreme distance or very high vantage points that shift the focus away from the individual and allow us to see the bigger picture. From a great distance or height, the invasion of manmade structures into nature is sharply highlighted. Many of the early images, such as Klausen Pass, Muehlheim, Anglers and Ratingen, show such manmade structures - a cable car, a motorway bridge, a concrete swimming pool - at odds with the landscape around them, literally stealing a piece of forest or mountain for their existence. For the people in the swimming pool, the site is probably huge – but Gursky’s angle lets us understand how insignificant human life and activity really is. In the 1990s, Gursky turned his attention to large-scale architectural structures, labour and scenes of industry - Frankfurt Airport, the container port of Salerno or the Tokyo stock exchange. But Gursky is not interested in the particular place, the subject of his images, but what it says about the world today. With his ‘democratic lens’, he presents a world without hierarchy, giving every little thing in the image equal importance. There is no central focus or narrative, instead, the eye is invited to wander and explore the scenes of simultaneous interaction. In Untitled I, he enlarges a small square of grey carpet in the Kunsthalle Dusseldorf in an extreme close up, duping the human eye, which can’t quite understand what it is looking at first, questioning what we deem is worth seeing or what is worth photographing. 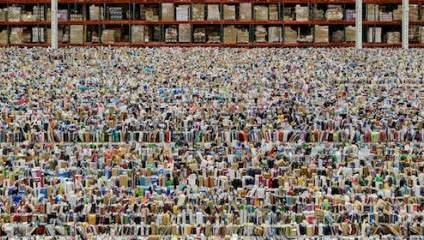 In 1991, Gursky began using computer software to digitally enhance his images. In an image of a Siemens factory he multiplied the wires and dangling cables, almost drowning out the human labourers. By overlaying multiple images, he eliminates perspective, the blurring at the edges that the human eye would naturally see, pulling everything at once into sharp focus. Images such as 99 Cent, depicting endless shelves in a supermarket or Paris, Montparnasse, Paris’s largest apartment building are dizzying in detail, impossible to take in when your eye is everywhere and nowhere at once. On the first floor, be prepared to be impressed first by the Hayward gallery itself, a minimalist brand spanking new white space with dazzling natural daylight flooding through the newly refurbished roof lights. Here, Gursky’s work continues with depictions of crowds, a rave, a Madonna concert, gymnasts in formation in Pyongyang VI, millions of little people filling every frame, giving the impression of endlessness. In F1 Pit Stop I, he multiplies the amount of mechanics working on changing the tyres so the actual car is almost drowned out with people. Untitled XVIII shows an enormous field of tulips. Viewed from afar, the plants arranged in neat rows almost resemble a minimalist painting; only a closer look reveals the individual velvety flower heads and the occasional worker within the rows of plants. Gursky’s highest vantage point can be admired in the series Ocean, constructed from satellite imagery, taken 35,000 kilometres above the earth. Antarctica is particularly impressive at making the human viewer feel small and insignificant. Works like Bergwerk, an Amazon warehouse or Untitled XIII depicting a rubbish dump give a rather shocking image of just how much stuff we humans own produce and dispose of. Yes, all the images are tampered with. Gursky does not give an authentic depiction of reality. He interprets reality – and possibly gives us an image that is closer to an emotional truth. Win entry to Kew Gardens with cream tea for two! Make the most of that springtime buzz you’re feeling. Win a Tate membership and get unlimited free access to every exhibition! The membership includes access to the acclaimed 'The EY Exhibition: Van Gogh and Britain'.